As a businessman, one of your top priorities is to make sure that your commercial property is well protected from devastating accidents such as fires. Many business owners fall into the trap of thinking that having a fire extinguisher service within their buildings is already a sufficient means of fire protection. However, keep in mind that the phrase fire protection services does not only entail the installation of fire extinguishers within your building. There are other essential components that you need to acquire and implement if you truly wish to protect your property and your workers from the devastating effects of fire accidents. The best thing that you can do to provide your property with complete fire protection is to work with a respected and reliable fire protection services company such as Local Fire. Local Fire is a 100% Australian owned and operated company established in 2002. We are dedicated to providing our clients with high quality devices and excellent services to suit their specific fire protection needs whether what they are looking for is fire extinguisher servicing or the installation of sprinkler systems within their buildings. Our experience and knowledge on how to effectively prevent fire accidents enables us to provide you with superb fire protection services that will truly protect your building, your home, your workers, and your family from the devastating effects of fire accidents. As stated above, a complete fire protection service does not only include the installation of fire extinguisher services. There are other essential devices and practices that play critical roles in protecting your building. Here are some of them. Aside from fire extinguishers, other devices such as smoke detectors, sprinkler systems, emergency lighting, fire alarms, and the like should also be installed within your property. You should make sure that there are exit signs present throughout the building and that the exit doors are functioning properly. Educate your employees or family members on how to use fire extinguishers properly. Also, make sure that they are located in accessible areas. Schedule regular fire drills. This will help in training or orienting your workers on what to do in case a fire breaks out. Most important of all, hire a reliable fire protection services company such as Local Fire to install and do regular maintenance checkups on your building’s fire protection system. 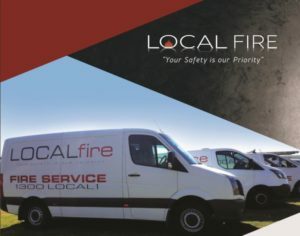 If you need more help and expert advice about fire protection services, then make sure to contact Local Fire today. We are here to help you protect the things and people you value in life,your business, your home, and most important of all, your family. Call us today.